Pro Umpire Camp would like to congratulate all the umpires who were hired into MiLB today! We would like to especially congratulate Pro Umpire Camp Alumni. All PUC alumni at the advanced course received a job offer! Congratulations Randy Wilmes on being promoted to the Midwest League. Randy worked the 2016 season in the Northwest League and will join fellow Pro Umpire Camp graduate, Darius Ghani in the Midwest League for the 2017 season. Randy is from Lincoln, Nebraska and is currently a Pro Umpire Camp Instructor. He has instructed the last two camps along side Darius. Pro Umpire Camp wishes both of you the best of luck this upcoming season! Pro Umpire Camp would like to congratulate the following alumni on being promoted! Both Lance and Tyler have been promoted to the Appalachian League for the 2017 season. Lance and Tyler attended Pro Umpire Camp in 2015 and 2013. They earned a position working in the American Association and both returned to school in 2016. There they received the good news of being selected for the advanced course. They then spent the 2016 season in the Gulf Coast League. Pro Umpire Camp would also like to congratulate the following alumni on earning jobs in MiLB! Congratulations to Andrew Clark, Matt Herrera, and Taylor Payne on being hired into MiLB! Andrew Clark is from San Diego and attended PUC in 2015. He was selected to work in the CanAm League that season. Andrew returned to MiLB Umpire Training Academy in 2017 and his worked earned him a place in MiLB for the 2017 season. Matt Herrera is from Katy, Texas and attended PUC in 2015. Prior to PUC Matt did not attended one of umpire schools. Matt's work ethic and umpire ability earned him the position to work in the American Association and the Atlantic Leagues for the 2015 and 2016 seasons. Matt then attended MiLB Umpire Training Academy in 2017 and earned a position in MiLB. Taylor Payne is from Missouri and attended PUC in 2015. Prior to attending PUC Taylor attended the Wendelstedt Umpire School in Daytona Beach, Florida. Taylor was selected to work the American Association for the 2015 and 2016 seasons. Taylor attended the MiLB Umpire Training Academy in 2017 and his work earned him a position in MiLB. Pro Umpire Camp would also like to say congratulations to David Cruz and Jordan Sandberg on being selected to work the Coastal Plains League! Keep up the hard work and congratulations! Pro Umpire Camp had ten alumni selected to attend the advanced course. Good luck Scott Shores, AJ Choc, David Cruz, Andrew Clark, Matt Herrera, West Hyer, Bryce McCalla, Taylor Payne, Steven Grady, and Jordan Sandberg. Keep up the hard work and good luck at the advanced course! Pro Umpire Camp is pleased to announce that the 2017 camp will again be operated out of Spring, Texas. This is the third consecutive year that Pro Umpire Camp will run out of the Houston suburb. It is a great opportunity for umpires of all skill levels to learn the three umpire system, as well as have the chance to work in a varitey of leagues in the summer. ​Ron Teague or Rich Grassa. Good luck at the advanced course and keep up the hard work! Congratulations to the follow Pro Umpire Camp Alumni on their promotions! Congratulations to each of you on your success. Keep working hard and have a great off-season! Pro Umpire Camp would like to congratulate Sam Burch, Darius Ghani, James Folske, Harrison Silverman, and Randy Wilmes on being selected to work the 2015 Arizona League Playoffs. This is a great honor and we are extremely proud of you guys. Congratulations and keep up the hard work! Pictures: (L - R) Harrison Silverman, Darius Ghani, James Folske, Sam Burch and Randy Wilmes. 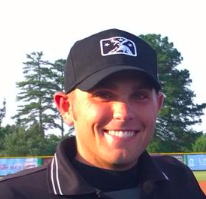 Pro Umpire Camp would like to congratulate John Durante on his promotion to the New York Penn League. John attended Pro Umpire Camp in 2013 and worked that season in the American Association. Great job! Congratulations Conor Culhane and Grant Hinson on being promoted to the Gulf Coast League! Conor attended Pro Umpire Camp in 2012 and umpired that season in the NYCBL while Grant attended in 2014 and umpired in the Prospect League. Great work guys and keep up the hard work! Pro Umpire Camp would like to congratulate Ron Teague and James Folske on their promotions! Ron Teague has been promoted to AAA Pacific Coast League and James Folske has been promoted from the Coastal Plains League to the Arizona League. All-Star game for the 2015 season. We are very proud of you and continue working hard. Great job! Ron Teague was selected as well but was promoted to AAA before the game. Brandon Gould has been promoted to the Coast Plains League for the start of the 2015 season beginning in June. Best of luck this season Brandon! Congratulations Mike Carroll, Justin Anderson, and Ryan Thacker! Mike Carroll and Ryan Thacker have each been promoted to the Pioneer League for the 2015 season. Justin Anderson was also promoted to the Northwest League for the 2015 season. Good Luck Mike, Justin, and Ryan! 5 PUC Graduates Assigned to the Arizona League! Randy Wilmes, Sam Burch, Andrew Larkin, Harrison Silverman, and Darius Ghani have all been assigned to umpire the Arizona League beginning in June, 2015. Congratulations Ben Sonntag and Brock Ballou! Ben Sonntag and Brock Ballou have both been promoted following the 2014 season. They began the 2015 season in the South Atlantic League and Midwest League respectively. Good luck to both of them as they continue their seasons! John Carroll of North Houston Tournament Baseball is pleased to announce that they have entered into an agreement with Charlie Strasser of CBCU to provide umpires to Baseball USA “The Yard” powered by Marucci, through the Pro Umpire Camp. CBCU has long been recognized as a leader in umpire education in the Houston area and is one of the premier scheduling organizations for baseball leagues and tournament hosts. CBCU provides scheduling services for Collegiate and High School events down through youth baseball organizations. CBCU hosts numerous educational events during the year utilizing professional and collegiate instructors to further its mission of providing top notch officials to its broad customer base. Carroll echoed the comments made by Strasser. “As the local host for Pro Umpire Camp, we felt that it was imperative to secure quality games and only first class facilities. Baseball USA is one of the most recognized names in travel baseball and we felt the PUC camp should be a partner with this facility. CBCU is the contract schedule for Baseball USA and is a valued partner for us. With the inclusion of Baseball USA, we now have a trio with Rothwood Baseball Complex and Premier Baseball of Texas that make up the 3 finest facilities in the Houston area. Collectively, we have secured the use of 34 fields of which 12 are artificial turf. This was important that in the case of inclement weather, PUC will still have the best opportunity for live, on field evaluations of their students. John Carroll of Houston, Texas, director of North Houston Baseball Tournaments, is pleased to announce they have entered an agreement with Lance Schoenwald to host the Professional Umpire Camp (PUC) March 2-8, 2015 in Spring, Texas. "This is something we have been after for a while now", Carroll said. "To get this camp that has provided so many opportunities to so many umpires over the last ten years is awesome. We are thrilled that we came to an agreement and have already lined up teams that will play in the 130 game tournament March 6, 7 and 8th. This camp is the premiere showcase camp for umpire school graduates to demonstrate their abilities to seven league supervisors, as well as two Division I assigners. Make no mistake about it, this is a tryout camp. This is where the leading independent and summer collegiate league supervisors come to fill their rosters." Camp owner Lance Schoenwald confirmed his camps move earlier today. "While we are sad to leave Shreveport after four solid years we were looking for an opportunity to operate a camp in early March as opposed to the third week in March." Schoenwald went on to say, "Moving the camp up before the start of Minor League spring training allows us to bring in current Minor League umpires to instruct.I am pleased to announce former American Association umpire Ron Teague will be our chief instructor. Ron is currently working winter ball in the Dominican Republic and will start his second season in the Texas League when the 2015 season opens." Once again the camp will have supervisors from the Atlantic League, American Association, CanAm League, Pecos League, East Coast League, Prospect League and New York Collegiate League in attendance to fill openings for the 2015 season. Already committed to join Ron Teague are fellow Texas League umpires Clay Park, and Matt Czajak, Blake Felix (Eastern League), Rich Grassa (Carolina League), and Michael Carroll (Arizona Rookie League). For more information please contact Lance Schoenwald at 720-440-1850 or email at proumpirecamp@gmail.com.